United States ZIP codes database one month subscription service. 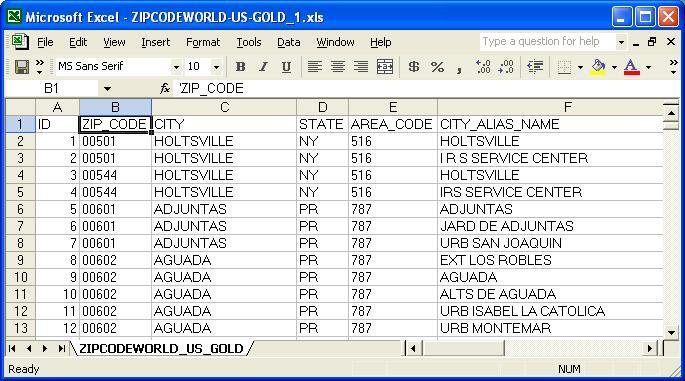 The database includes 3-Digit ZIP code, destination name, sectional center facility, area distribution center, 5-Digit ZIP code, city name, alias city name, state code, phone area code, city type, county name, country FIPS, time zone, day light saving flag, latitude, longitude, county elevation, MSA, PMSA and Census 2000 data in United States. The complete database contains over 76,000 precise records. Immediate download available in several formats ie. ASCII text, Microsoft Excel, Microsoft Access and dBASE V.